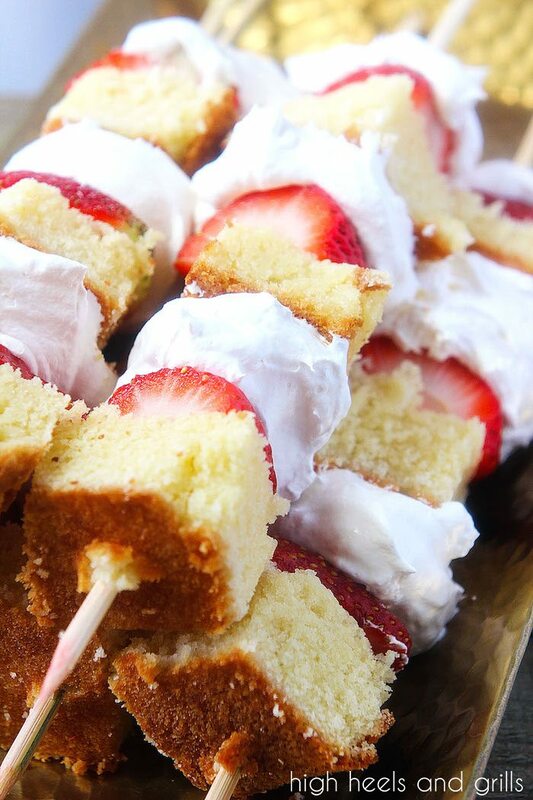 These Strawberry Shortcake Kabobs are an easy dessert recipe for parties or dinner. 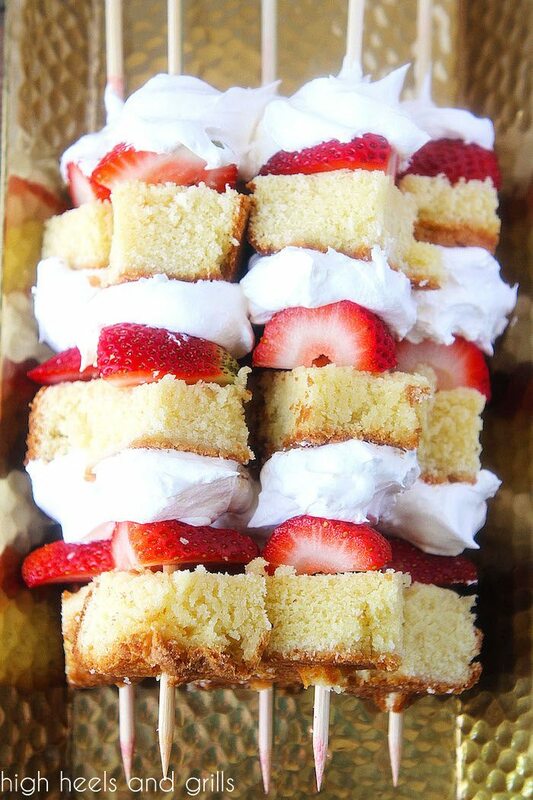 They take your favorite parts of strawberry shortcake and put them in a few, easy bites! Strawberry Shortcake has been a part of my family since I was little. These Strawberry Shortcake Kabobs brought back all of those childhood tastes, but they were a little bit easier to make than the recipe that my dad would use. His recipe consisted of Bisquick Mix and actually having to preheat the oven. While it was ridiculously delicious, I absolutely love this easy version of it! I know there are a ton of amazing dessert recipes out there, but I thrive on ones that I don’t even have to bake and are easy to assemble. These Strawberry Shortcake Kabobs fit the bill perfectly. Plus, they are made with real whipped cream, so all of you fake whipped topping haters can cool your jets! A few people have asked me how to get the whipped cream to stick to the skewer. Make sure the whipped cream has very stiff peaks and then layer it on top of the pound cake, so it has a wider base to sit on. If needed, you can place the whipped cream in the refrigerator for a bit to stiffen it up even more. Another fun tip is that if you remove a cake, strawberry, whipped cream trio from the skewer, rather than just biting it off, it makes a perfect, little strawberry shortcake bite! I hope you enjoy these as much as I do! *This post was originally seen on Real Housemoms. It was posted there by me and is now being shared here for you to enjoy.